Our my goal over the next series of articles is to teach you 'step-by-step' how to dominate your market online. 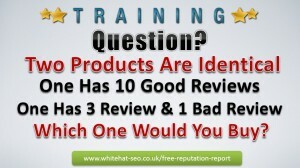 At White Hat we are the experts in local online marketing. The proprietary system and marketing strategies I'm going to be giving you will give you the edge that your company needs to achieve a five star reputation in your industry and position your company as the market leader. So let’s start out by talking about some of the dramatic shifts that have just happened in the marketplace. I want to do that by showing you that every day people look online for your products and services. Here are some stats from Google. Forty thousand people typed in the word dentist London last month, nearly two thousand typed in the phrase 'dentist Kensington'. In a small area like Kensington, two thousand searches. Look at Birmingham, beauty salon birmingham, twenty nine hundred, florist manchester, four thousand four hundred. The numbers are astounding. Just imagine hundreds if not thousands of people online every single month looking for your business. The question is, can they find you? Because everyday people, as you can see, are looking for businesses and services like yours. The problem is who should they do business with. And what they're doing is they're looking for the most reputable company to do business with, and in this series of memexes we’re going to show you how to make sure that you are the business that they call and not your competition. So let me start by asking you a question. Would you buy a product or service that has bad ratings and reviews? Obviously, you would say no, because no one wants to actually have that exact same bad experience when they buy a product or service. So we always look at reviews as the indicator of how we might experience that product or service. But here is the more important question. Two products are identical; one has ten good reviews; the other has three good reviews but one bad review. Which one do you buy? Obviously, it's the one with ten good reviews. And why is that? Because we want to have a great experience and we’re looking to make sure that a company is consistent with delivering that experience or that product or service. So this is what consumers, individuals, and companies do every single day. They go online and they're looking to find the most reputable company to do business with. Only one bad review, as you can see here, can send the customer from your website or your listing online to someone else's. So that means difference between your phone ringing or your competition's phone ringing. In the next session we will look at how the online environment is changing and why search engine reputation management is driving the change. 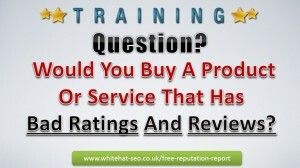 If you would like to ask White Hat for help to manage your online reputation - call us on 020 8834 4795.